In all the hue and cry about stocks and bonds and cryptos, when was the last time you read a mainstream headline about silver? Truly the forgotten commodity lately, which is exactly what you want when you’re a buyer. Silver’s recent chart couldn’t much sleepier, which is exactly what we could have said about the VIX before it recently surged 86% in a day. Governments and central banks “print” currencies more rapidly than the underlying economy expands. Hence prices for most items, including silver, rise. Compare 1971 prices to those of 2018. Nothing has changed since 1971 to reverse these policies. The froth and speculation in the last six years have gone into the stock market, the 35-year bull market in bonds, and Bitcoin. Silver has been forgotten since it peaked in 2011. Silver prices were higher in 2008 than they are today. 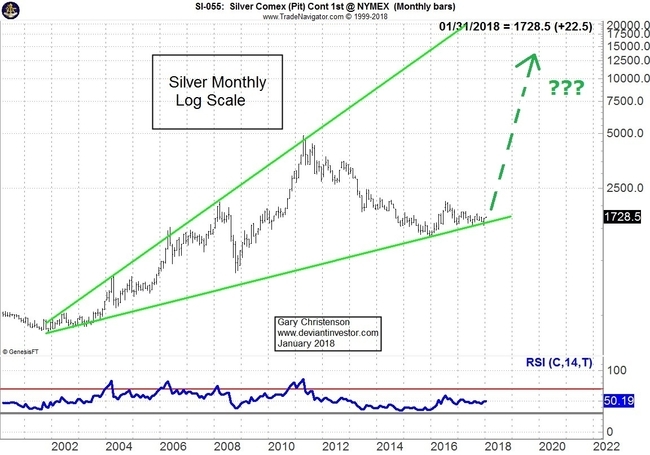 Expect silver prices to rise, probably too far and too fast, like stocks and cryptocurrencies did in 2017. The charts show that $50 – $100 silver is likely in a few years. Challenging economic conditions – any Black Swan – would make $100 to $200 silver probable.